A R T & D E S I G N b y c a n d a c e b r e k k e : Deck the Halls! Have I told you how much I love Christmas decorating?!?!? I LOVE CHRISTMAS DECORATING! This is the earliest I have ever started, but we got the living room painted this weekend so I was anxious to let the magic begin. :-) Here is my most favorite decoration so far. I painted these wooden letters last year, but I really wasn't happy with how I displayed them. They look a little like Uppercase Living letters on this photo, but they are actually just thin wooden letters I picked up from Hobby Lobby and painted dark brown. I put two hooks into the wall and placed a birch branch across them and then hung the letters from that so they dangle down and cast a shadow from the mantel's white lights. 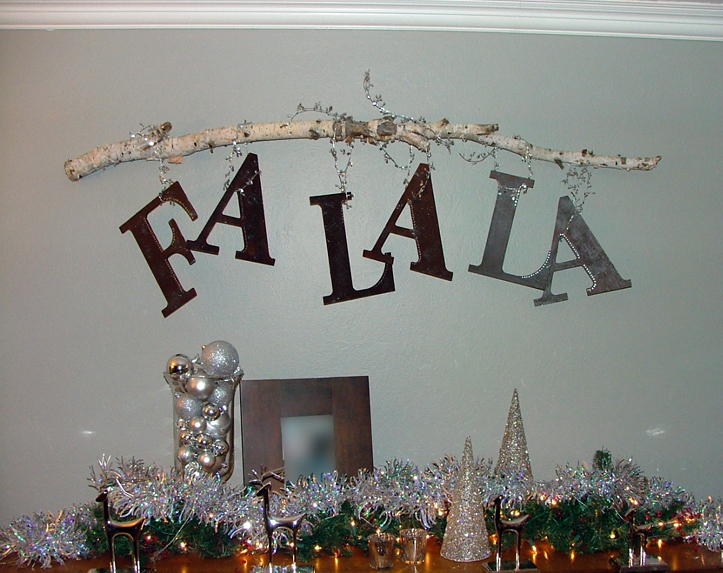 Now, this may not be the best way to attach a birch branch to a wall, but I tend to do things on a whim when I have a creative idea in my head! So far it has worked just fine and I'm pretty happy with it.